Directions: From the intersection of Ranch Road 12 and Hamilton Pool Road, going (left) northwest on Hamilton Pool Road it is about five miles to the park entrance road which will be on your right if you are going northwest on Hamilton Pool Road. Do not miss the park entrance. If you pass up the park entrance the road changes, narrows, and there are sharp switchbacks. This section of the road is not recommended for trailers and you will see warning signs stating this. Equestrian Camping: None at the park. 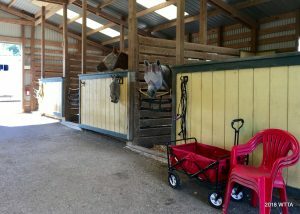 A look inside the boarding barn at Cedar Grove Stables near Dripping Springs, TX. Cedar Grove Stables is a small private facility owned by Carol and David Grosvenor, about four miles from downtown Dripping Springs, 25 miles southwest of Austin, seven miles from Dripping Springs Ranch Park, and 25 miles from Johnson City. See their website regarding driving directions. Google Maps will suggest roads that are not trailer accessible. Facilities: For equestrian guests, Cedar Grove Stables offers four 12′ x 12′ stalls in the barn with attached lighted paddocks. Paddocks and stalls can be used separately to accommodate more horses. Water is available in the pasture and barn. There are two hookups for 50 / 30 / 20 amps. Each one can handle two rigs and a separate 30 amp hookup. Trailer parking is in the pasture. 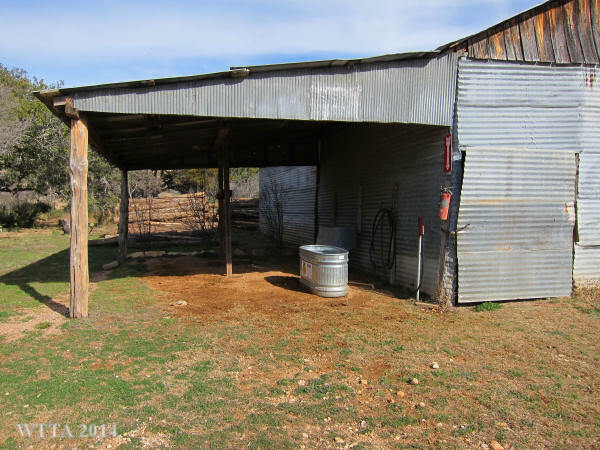 Lighted arena / pasture, small lounge & tack room, and bathroom (no shower) is available. Driveway can accommodate rigs up to 34′ long. Trees are cleared to 13′ height in driveway. 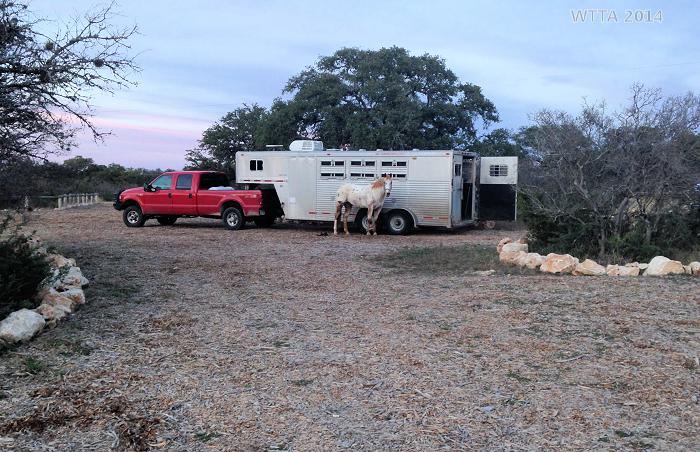 Cedar Grove Stables is in close proximity to Reimers Ranch, Pedernales State Park, Wimberley Rodeo Arena, and Dripping Springs Ranch Park (show arena). See their website for details & pictures. Equestrian Trailhead: After going through the park entrance gate house stay on the paved park road, the road is curvy so go slow. You will see a metal barn structure on your right and an equestrian parking sign. The trailer parking area at the equestrian trailhead is mostly dirt/caliche covered with peat moss and gravel entrances. The parking is also not large but you can park a big rig there so long as there are not too many rigs parked. 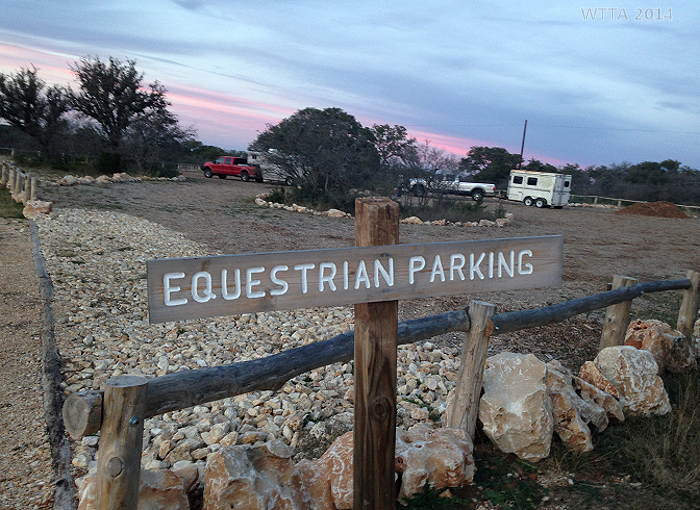 The Equestrian Parking area has been updated. Now there is a sign, gravel entrance, soft peat moss footing, wood railings, and an additional picnic area. Horse trailer parking is on the other side of this metal barn. At the end of our ride, we are heading to the water trough on the other side of the barn. 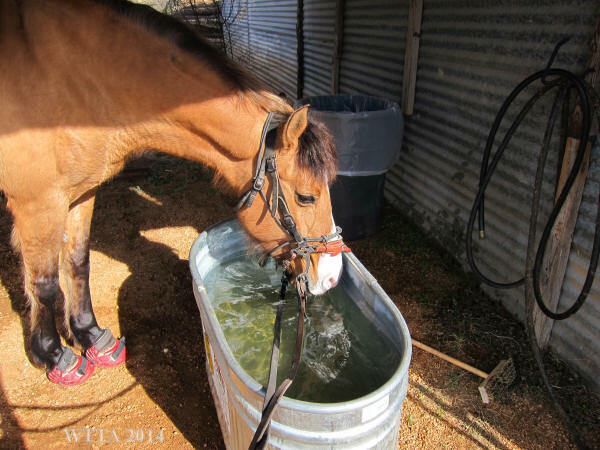 Facilities:At the equestrian trail head and trailer parking area there is a water facet and water trough under the barn awning. There is one picnic table close to the barn under the trees and a second picnic area and table under another large tree. There is a mounting block. On the other side of the barn is a porta potty. There are no other facilities in this area. However, if you continue just a short distance west on the main park road there is a pavilion and restroom facilities on the left. The water trough is located under the shade of the barn awning. The water in the horse trough was clear and clean! Angel enjoyed a long cool drink of what appeared to be fresh clean water. I’d recommend dismounting for your horse to drink here, as the awning is low. Mileage: 4-5 miles of equestrian trails. I used my MotionX iPhone application to clock our miles. Riding clockwise and taking Turkey Loop, MotionX reported the mileage as 5.11 miles. On our second ride out we rode counter clockwise and skipped Turkey Loop, MotionX documented this ride as 4.35 miles. Trail Users: The majority of trails at this park are for hikers and off road bikers only. 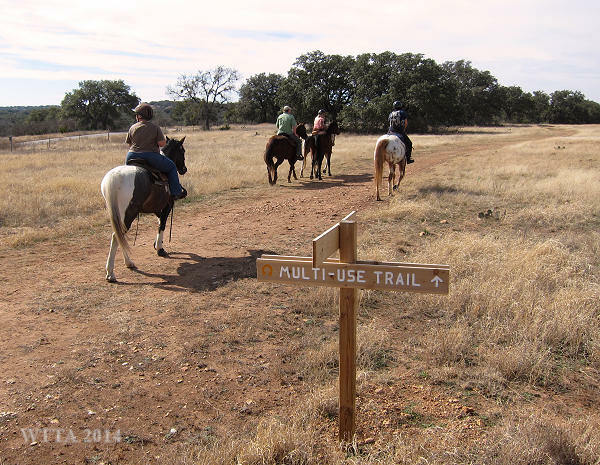 However, equestrians may share the multi use 4-5 mile trail with hikers and mountain bikers. No motorized vehicles are allowed on the trails with the exception of the park rangers. Trail Signs: Overall the Multi-use equestrian trail is easy to follow and fairly well marked by wooden signs with horseshoe symbols. Trailhead trail marker sign just behind the trailer parking area near the metal barn. Carol on Bug and Caroline on Jack returning from our second ride out. The trails are well marked and easy to follow. 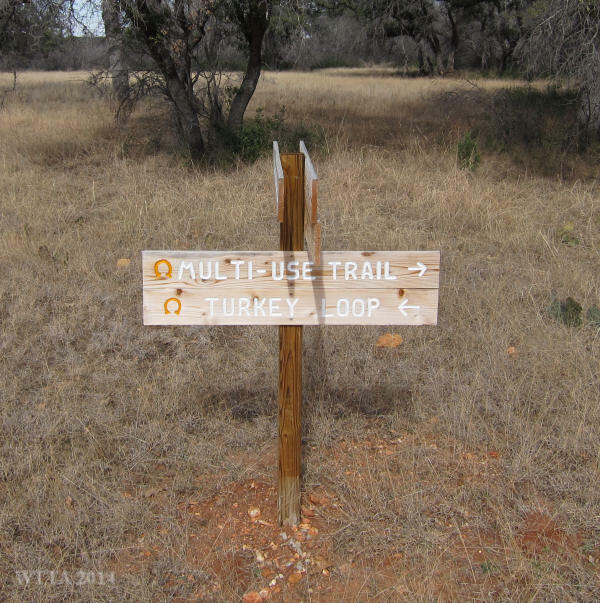 If it says multi-use and/or has a horseshoe symbol then you are on the right trail. Taking Turkey Loop will add approximately one mile to your overall distance covered. Terrain: The terrain on the multi-use equestrian trail is mostly a flat level sandy clay like surface with very few rocky areas. 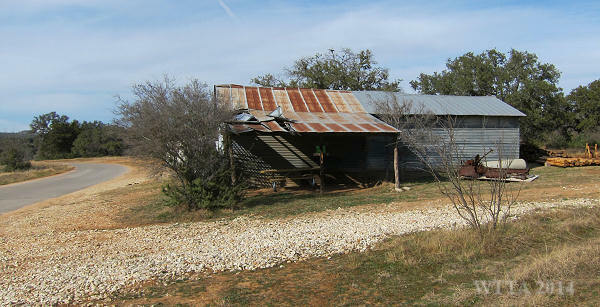 The terrain is not challenging but does provide wide open views of the hill country. I only saw one water source, a creek, along the trail but the trail did not directly lead to the creek and it would have been steep and full of brush to try and get down into the creek. 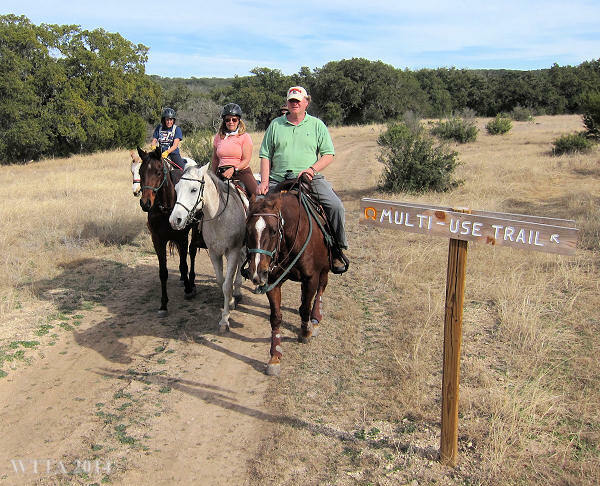 The Equestrian multi-use trail does not provide access to the Pedernales River. According to the map, from Turkey loop (northeast side of the park) a trail breaks off and does go to an overlook near the river. This part of the trail is marked as a primitive hiking trail and is unfortunately not part of the equestrian multi-use trail. Milton Reimers Ranch in Dripping Springs, TX is part of the Travis County Park System and is the largest parkland acquisition in the history of Travis County, totaling 2,427 acres according to the Travis County Parks’ website. This park is well known to mountain bikers and rock climbers providing 18 miles of bike and hike only trails with extremely challenging terrain. The park is fairly new to equestrians and contains a 4-5 mile multi-use trail which allows horses! That is not a lot of trail when compared to the park’s size, but it is progress considering how many parks do not allow equestrian use at all. Although the trail is marked for multi-use, it is primarily used by equestrians. Don’t let the concerns of extremely challenging terrain and the thought of frequent encounters with off road bikers deter you from visiting this park with your horse. During my visit I saw two or three bikers at most. On my second visit I did see several bikers but only near the equestrian parking area on the southwest side, I think the bike only trails intersect with part of the multi-use trail in this area. Riders who frequent the park state that bikers rarely use the equestrian multi-use trail due to the lack of challenging terrain. When I did a Google search on the park, all sorts of bike videos and comments were found on how fun, challenging, and difficult the rocky terrain is at this park. 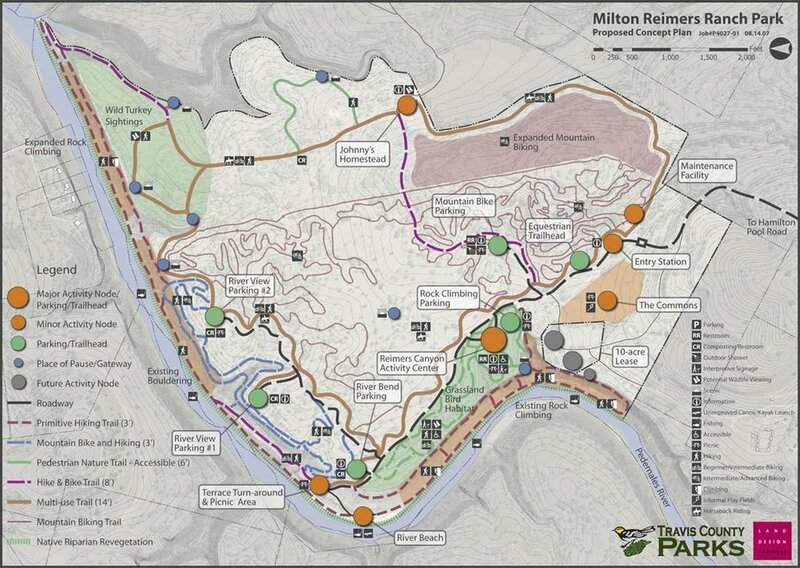 This may be the case for the 18 miles of bike trails but it is not so with regard to the multi-use trail. The equestrian multi-use trail is wide (two track) with no tight spots and would mostly likely work well for horse drawn carriages and carts. The terrain is mostly flat and non-challenging. Furthermore the surface of this trail is mostly sandy clay dirt with some rocky areas; my horse did not need to wear her boots. The land is wide open with lots of space on both sides of the trail and very few shady areas. 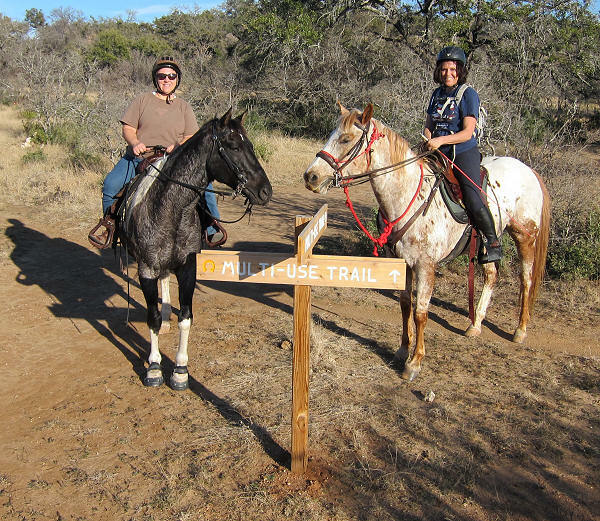 The wide open trails also give you room to do some technical work with your horse such as circles, circling other riders, serpentines, working on getting passed and being passed, and other maneuvers not easily done on a tight single track trail. My mare is very forward and would prefer to be in front all of the time, so taking advantage of the open space to do these exercises and changing positions from being last, being in the middle, and being in front is a great way to improve our trail etiquette. For these reasons the wide open space is a plus for me and having equestrian friends to ride with who put up with me doing all this is an added bonus as well. A negative for me in regards to this park is the distance from my home versus the limited trail mileage, but if you live nearby or prefer to ride a shorter distance, then you just might love this park. I have heard that this park maybe adding more multi-use trails!